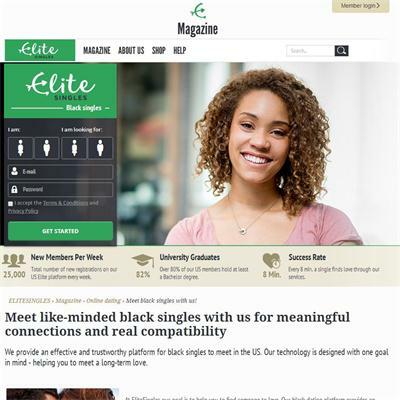 EliteSingles is one of the best internet dating platforms and unquestionably the top dating site for graduates and professionals searching for long-term relationships. The website is open to straight, lesbian and gay singles and uses a detailed personality test to match singles with their potential partners. EliteSingles boasts of over 18,000 fresh members every week and way over 13 million existing users, making it one of the biggest and fastest growing online dating service provider. Most of the users are serious singles aged 30+ and ready to settle down. The EliteSingles signup process demands a high level of honesty and dedication. The EliteSingles team believes that the solution to compatibility can only be achieved through personality matchmaking and as such, you need to invest a lot of time in the account creation process. New users should use at least half an hour to answer the personality test. After finishing the quiz, you will be required to provide a list of four words that your friends would use to describe you. The subsequent stage of the signup process involves selecting the hobbies you would want a potential partner to enjoy. This may range from travel and cooking, all the way to spending time with friends and family. The last segment covers children and smoking and drinking habits. A combination of all of these elements helps EliteSingles dating platform to create a powerful and efficient algorithm to match like-minded singles. Members receive daily 3-7 match suggestion sent to both their email inbox and EliteSingles homepage. Premium subscription unlocks up to 20 extra daily Wildcard match suggestions. The suggestions are based on the main elements of a one’s personality using the Big 5 Model of Personality. EliteSingles boasts of its powerful and intuitive mobile apps for both Android and iOS devices. The apps allow the users monitor and respond to messages as well as access other important features on the go. In addition, the EliteSingles webpage is very mobile friendly. The site also offers easy communication tools including the 5 ice-breaker questions, Smiles to portray interest and the Inbox messaging feature. Over 80 percent of EliteSingles users have a University or college degree. EliteSingles is almost exclusive to singles seeking serious long-term relationships. EliteSingles has an Identity verification feature to help weed out scammers and spammers. Subscription cost to the monthly premium membership is relatively high. No video chat or instant chat feature. Most of the members are 30+, a disadvantage to singles looking for younger partners. Users can not search for potential partners manually. The free membership plan offers limited access to the site’s features. The site ensures that their clients receive a very high level of privacy. Basically, the only users who will be able to see your profile page are your potential matches. This eliminates the worry of having a large number of strangers drooling over your profile. In addition, EliteSingles uses a secure software which makes sure the no photos can be copied or downloaded from the site. All user data is encrypted with SSL security. The site is okay in terms of design but could use some improvements in the layout. The site is mobile friendly and easy to navigate. The registration process is quite lengthy but necessary since the site relies on a comprehensive personality quiz to find the perfect matches for its users in the shortest time possible. EliteSingles is the most recommended online dating site for professional singles aged between 30-55 looking to find serious partners and settle down. With its ultra-modern security, social media integration features, and the intuitive mobile apps, EliteSingles is the place to be. My question is regarding the subscription. Say I sign up for the 12 month subscription, can I cancel at any time or am I obligated to pay for the full 12 months?